The unseasonal cold weather we've just had made me feel like warm, comforting foods. To be honest, it made me feel like eating chips! 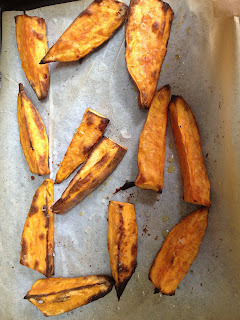 Luckily I was able to satisfy this craving with some delicious sweet potato wedges, in place of regular potato chips. It felt good to be getting good nutrition from what is usually an unhealthy indulgence. Roast for about 25 minutes in a reasonable hot oven (190 - 200C), until tender and golden brown. Sweet potatoes are one of the richest source of beta-carotene - a precursor to Vitamin A. Not only is Vitamin A necessary for good eyesight, it is also necessary for a strong immune system and healthy skin. Sweet potatoes also have a lot lower GI (Glycaemic Index), so are good for those trying to lose weight.